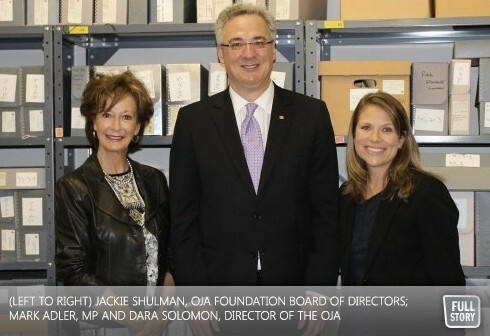 UJA Federation’s Ontario Jewish Archives, Blankenstein Family Heritage Centre (OJA) has received a $195,100 grant from the Canadian Government through the Canada Cultural Spaces Fund for the renovation of its vault and public space. The announcement was made on September 11, by Member of Parliament Mark Adler (York Centre) on behalf of the Honourable Shelly Glover, Minister of Canadian Heritage and Official Languages. “We are pleased to provide funding for the Ontario Jewish Archives, an important cultural space in our community that hosts a significant collection of artifacts documenting the contributions of the Jewish community in Canada,” said Mr. Adler. This grant will support the installation of a modern, dedicated HVAC for the OJA vault as well as new lighting, monitoring system and compact and moveable shelving that will provide the archives with more storage space and better environmental conditions. The project will also update the public areas, creating a more comfortable and efficient space for researchers and staff. This grant is matched by funds generously provided to the OJA by the Blankenstein family.